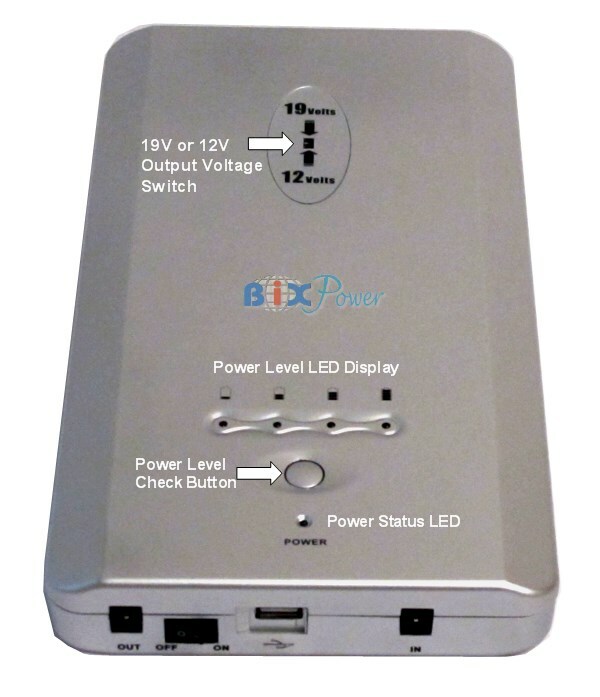 Super high capacity, long run time, external rechargeable universal battery pack for laptop notebook computers and other devices. Made with high quality Panasonic Li-ion battery cells. Its universal platform works for most of the notebook computers on the marketplace. Its compact size can easily fit into a laptop/notebook carry bag. * Battery capacity may change from time to time. It was 153Wh, 159Wh before Oct 2018. Starts from Oct. 2018, it is larger capacity: 188Wh. * * We may discontinue some old tips and add some new tips without notice. Actual connector tips may not be exactly same as the pictures show. Note: There are many different ways to rate a battery capacity on market. For your information, a typical 6-cell internal notebook battery capacity is about 49 Watt-hour, a typical 12-cell internal notebook battery capacity is about 98 Watt-hour. OUT -- Battery power output port, connect to output cord. ON/OFF -- This On/Off switch controls output port power. You can use the 5V USB Port on the battery to charge cellular phones, MP3 player or other small electronics that can be charged from a 5V USB port. However, the battery pack does not come with any cable for connector tips for this USB port. Our optional Z4 cable and connector tips will work with this 5V USB port. VESA Mount Kit is available as an option. 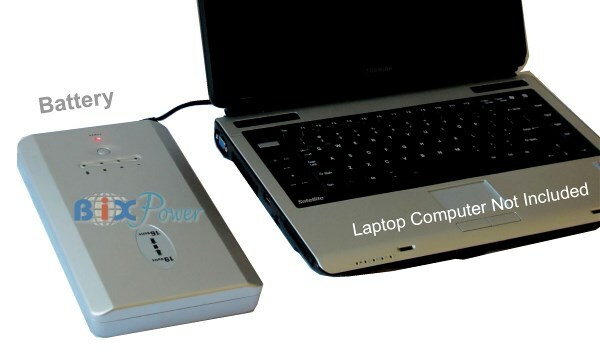 How to use battery Plug to the laptop/notebook computer's DC power input plug, plug and play. Insert the battery into the laptop/notebook computer's battery bay. Compatibility Can be used for 90% of laptop/notebook computers on the market. When you upgrade your laptop/notebook computer, you may still be able to use the battery for new laptop/notebook computer. Every internal battery is proprietary. Different laptop/notebook computer needs different battery. Other usage Can provide 12V and 19V DC power for other electronic devices also. Can only be used for designed laptop/notebook computers. 1. Charge the battery: This battery has its own AC battery charger and 12V car charger. You can charge it from any 110V or 220V AC power source or from a car 12V cigarette lighter socket with the 12V car charger. Both the AC charger and the 12V car charger need to connect to the In port of the battery pack. To quickly charge the battery, we recommend to charge the battery fully while it is not in use. The BP160 is specially designed to be able to charge and discharge at same time. However, since each lithium battery has limited charge/discharge cycles (around 500 cycles), it is not recommended to use the battery when AC power is available. After the battery has been fully charged, set the voltage output of the battery close to your notebook DC power input requirement (which is same as your notebook AC power adapter's DC output voltage). This battery has a switch to set the voltage output at 12V or 19V. 12V is compatible with 11V~13V, 19V is compatible with 18V~21V. The cigarette lighter adapter is optional, not included in the battery pack. Included with your battery is a output cable with more than 18 different connector plug tips. One end of the cable(Z6 cable connector) will connect to the battery output port. The other end has a 5.5 x 2.5mm connector which will fit a lot laptop notebook computers and other devices. If the Z6 cable connector does not fit your laptop notebook computers, you can use any of the included connector plug tips that work with most laptop notebook computers. With the plug tips not connected to the output cord, locate the correct one by fitting it into your device's DC Jack. The tip should fit snugly in the DC jack. Then, plug the tip into the Z6 output power cable. Just that simple. Now you are ready to use it ! Note: If your notebook internal battery is a working battery and has been fully charged, you can leave it in your notebook. Otherwise, we recommend you removing the internal battery from your notebook to maximize the external battery running time.The external battery will still work fine if you leave the non-charged internal battery in the notebook, but it may not reach the maximum running time. This is because it charges the internal battery at the same time it is powering the computer. How long can this external battery run ? 11.1V x 4400 mAh = = 49 Wh (Watt-hour). If your internal notebook battery can run 2 ~ 3 hours, then the external battery pack can theoretically run about : 7 ~ 10 hours. This is a rough estimate. Actual running time varies, depending on notebook computer's configurations and what kind of applications running . For example, screen brightness, the use of the CPU, the hard drive, the CD drive, and other peripherals results in an additional drain upon the battery, effectively reducing the battery's run-time. The total run-time of the battery is also heavily dependent upon the design of the notebook. To ensure maximum performance of the battery, optimize the computer's power management features. Refer to the computer manual for further instructions. I have been using external laptop batteries for a number of years. I am most impressed with this one. The battery life is incredible. I can use this for 3 or 4 hour lectures and there is still a lot of battery to go around. The last one I used for the last two years from another brand, was much smaller and gets very hot. Eventually, after two years, that old one became so hot one day, that the glue on the wires melted and got fused to the machine. I was fortunate it did not explode. I threw it away and got this as a replacement. With the BiXPower 153Wh, it was much bigger than I expected it. However, this is to be expected as it is 42500mAh in capacity. I carry it in my backpack wherever I go and do not have to worry about my laptop running out of battery even after long uses in lectures or when I am studying in the library reading through online journals. I usually have my laptop on my desk with the wire running connected to the BixPower device in my bag. I am very impressed. I highly recommend this if you are looking for a battery pack that will last many hours. I am very happy with my purchase and will buy it again in future. A must have for all your portable power needs. I can't live without this product. I use it to power a fan while camping. Will hold charge to power a fan 24/7 for 2 days. Recharge time is 4 hours Customer Support if the best. Had problems with lighter charger for car. It kept burning out. Always sent a new one. However Best to get an inverter to plug into that for charging on the go. Charging adapters for most laptops. Only suggestion is to have more USB outlets. The seller is very trustworthy and will always buy from again. This is our 4th battery from BIX. We are using these for RF testing, typically running 6 phones/modems simultaneously and a tablet computer all day, walking around in a large subway system, where you don’t find AC outlets. With the capacity density delivered in this little box, our testers can work a full 8 hours before recharging, and don’t get weighed down after a day’s work carrying this around in a backpack. For normal users, the lack of output connectors may be an issue; since we’re already past a typical consumer use and build our own DC distribution boxes that do DC to DC conversion, it’s not been an issue for us. I bought this because I have a friend that uses it religiously while working from cafe to cafe were in some cases there is no electric outlet. The charging is excellent. I haven't had this too long so I can not comment too much on it durability of charge. I will come back and make updates for folks. If you have an Apple product please buy the Magsafe 1 or Magsafe 2 (T-Head) for your MacBook/Pro. The only thing that I was disappointed by was the quality of the plastic paint. It wears easily and stains easily. It is a porous surface (meaning hasn't been sealed to prevent staining). The grey does have a tendency to stain things so be careful. This is a big deal, but it is annoying. I refuse to take a star away from these folks for this issue. I hope they can at least seal the outer case someday. Also, this is not lightweight. It's not very heavy but still carries a load in a backpack. It's nothing too bad, but it is a slight load. My experience is that they are reliable, well built, and a great value. I've owned the first one for a year, the second for about 6 months. They are used very heavily several times a week and are both performing great.